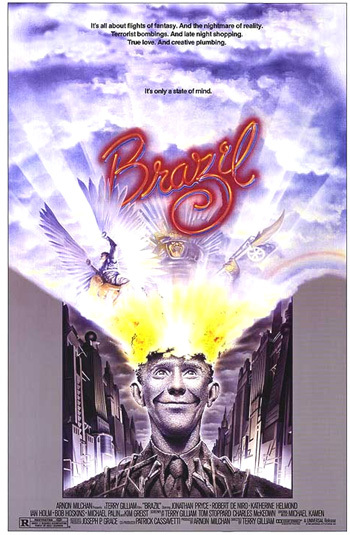 Brazil (1985) is from director/co-screenwriter Terry Gilliam - a combination science-fiction, despairing black comedy and fantasy that combines elements of Fritz Lang's Metropolis (1927), Kubrick's Dr. Strangelove (1964), Fahrenheit 451 (1966), George Orwell's novel 1984 (and director Michael Radford's 1984 (1984) that opened at about the same time), Kafka's The Trial, Anthony Burgess' A Clockwork Orange (and Kubrick's A Clockwork Orange (1971)), and Ridley Scott's Blade Runner (1982). Throughout this superb film that satirizes modern technological society, one can glimpse numerous government propaganda signs, billboards, posters and writings that preach conformity and Big Brother wariness - all references to Orwell's 1984. [Note: The signs are credited to co-scriptwriter Charles McKeown.] Police are represented as storm troopers (Nazi-like), and the names of two major officials have stereotypical German names: Kurtzmann and Helpmann. The influential film's enigmatic title refers to the popular Latin song from the late 1930s by Arry Barroso, often used as an escapist theme in the orchestral soundtrack (by Michael Kamen). Other titles were considered for the film: The Ministry of Torture, 1984 1/2 (homage to Fellini's 8 1/2), and How I Learned to Live with the System - So Far. The normal workers in society are docile, powerless, and obedient - to avoid calling attention to themselves and ending up eradicated (literally and figuratively) from the files in the Ministry of Information's flawed computer system. This popular and compelling film with a large cult following is one of the most visually imaginative, breath-taking, eccentric films ever created, with incredible sets, dazzling inventiveness and production design (by Norman Garwood). The film is so visually dense that it takes several viewings to fully comprehend (i.e., the billboard slogans, the user-unfriendly technical gadgets, the unforgettable images, etc.). With still a million things to say"
It's all about flights of fantasy. And the nightmare of reality. Terrorist bombings. And late night shopping. True love. And creative plumbing. It's only a state of mind. The film's chain of events is set in motion by a clerical error, which condemns an innocent man, and causes Sam to meet his dream girl - a suspected terrorist. His apparent salvation from the nightmarish, chaotic, paper-choked, poorly-functioning society comes in the form of a guerrilla heating-engineer and terrorist enemy of the state Harry Tuttle (De Niro), whose renegade behavior is opposed by the state's own Central Services representative (Hoskins) and Sam's friend-turned-sinister MOI official Jack Lint (Palin). But in the end, the lowly and self-deluded worker is persecuted and tortured to death while again imagining escape to an illusory idyllic paradise that is free of societal restrictions. However, it may be argued that the existence of 'terrorists' in the film (i.e., Jill Layton, Buttle/Tuttle, and Sam are all accused of being terrorists) and various 'terrorist' acts (i.e., the restaurant and shop bombing, the blown up car) are deliberately made ambiguous - it is very probable that the central threat of terrorism is the government's way to silence deviation, provoke fear, cover up its multiple errors, and provide a scapegoat enemy. Viewers must interpret this central theme of the film for themselves - and recognize the fact that ironically -- there may be no terrorists at all. The film fared poorly and disappointingly at the box-office. However, in intervening years, especially after the release of the original, full-length Director's Cut (142 minutes long, combining footage from both the American and European theatrical release versions), it has been critically-acclaimed as a social satire on the dehumanizing, claustrophobic effects of technology and government, and regarded as one of the greatest cult classics ever made. (Chorus) Central Services - We do the work, you do the pleasure. The camera slowly pulls back, identifying the TV screen as one of many in another frame - a department store window display. As a Christmas shopper, with a cart filled with parcels passes by the window from right to left, a violent explosion from inside the store breaks the glass and destroys the man by its shattering glass, glowing sparks and fire. The film's title, accompanied by dramatic musical tones, appears as a red and purple neon sign that tilts upward from a horizontal position. It pulses and glows brightly and then rushes toward the camera. Interviewer: What do you believe is behind this recent increase in terrorist bombings? Helpmann: - they'd get a lot more out of life. Interviewer: Nevertheless, Mr. Helpmann, there are those who maintain that the Ministry of Information has become too large and unwieldy...And the cost of it all, Deputy Minister? Seven percent of the gross national product. Helpmann: I understand this concern on behalf of the tax payers. People want value for money. That's why we always insist on the principle of Information Retrieval charges. It's absolutely right and fair that those found guilty should pay for their periods of detention and for the Information Retrieval Procedures used in their interrogation. Interviewer: Do you believe that the government is winning the battle against terrorists? Helpmann: Oh, yes. Our morale is much higher than theirs. We're fielding all their strokes, running a lot of them out, and pretty consistently knocking them for six. I'd say they're nearly out of the game. Helpmann: Why should decent law-abiding citizens have to subsidize criminals? Interviewer: But Mr. Helpmann, the bombing campaign is now in its thirteenth year. The scene shifts again, using the TV screen as the common element from scene to scene. In their apartment, a family (the Buttles), composed of the parents and two children (nine year old Boy Buttle, Simon Nash and six year old Girl Buttle: Prudence Oliver), is watching the same interview as it ends in their Christmas-decorated living room. Mrs. Buttle (Sheila Reid) is reading Charles Dickens' A Christmas Carol to her daughter - her first word associates the miserly Scrooge with Helpmann: "Scrooge was better than his word..." The young boy plays with a toy machine gun and dark-colored toy action figures (a foreshadowing). The room has huge, blackish-gray ductwork suspended just below the ceiling. On the apartment floor above them, the upstairs tenant's TV screen broadcasts the Marx Brothers' first feature film Cocoanuts (1929). At the end of a long hallway is the tenant's bathroom, where an amused, short-haired, butch young woman (a truck driver) - named Jill Layton (Kim Greist) - is scrubbing the grime from her nails and smoking a dangling cigarette while taking a bath in dirty water. [The TV's image from the living room is reflected by a series of mirrors into the bathroom where she watches the film on another mirror.] She is startled to see the shadow of a uniformed intruder momentarily block the image as he crosses in front of one of the mirrors in her living room. She sinks deeper into the water as she calls out: "Who's there? Who is that?" I hereby inform you under powers entrusted to me under Section 476 that Mr. Buttle, Archibald, residing at 412 North Tower, Shangri La Towers, has been invited to assist the Ministry of Information with certain inquiries and that he is liable to certain financial obligations as specified in Council Order RB-stroke-C-Z-stroke-nine-O-seven-stroke-X. That is your receipt for your husband. Thank you. (He takes back his pen.) And this is my receipt for your receipt. Tuttle? His name's Buttle. There must be some mistake. A close-up of Mrs. Buttle's receipt serves as the transitionary image to the next scene in the Record Clerks Pool of the Ministry of Information. There, a white and pink copy of Mrs. Buttle's receipt (in close-up) is stamped 'DEPT. of RECORDS' - the white copy is placed on a sharp spindle at the record clerk's desk, and the pink copy is stacked in a desk-side tray. Two incredible dolly shots (first pulling backward, then moving forward) track through the clerks' pool - in homage to Kubrick's moving shot in the WWI trenches in Paths of Glory (1957). The pink form is immediately picked up by a bustling office boy moving through the aisle. There is tremendous activity between expansive rows of desks each equipped with TV screens (each with an extended magnifying lens), lockers, and piles of paperwork. Dozens of clerks and office workers hurriedly dart to and fro. Supervising and surveying the office area from a raised stairway is the boss, Mr. Kurtzmann (Ian Holm), who stands before his private, opaque glassed-in office. [The forward tracking shot ends with the zoom up to Kurtzmann.] When he disappears into his office and closes the door, all of the fervent motion ceases, and the workers tune their TV screens into an old western. Kurtzmann checks out one of the Ministry of Information (M.O.I.) records - the one for Buttle, Archibald. He types the name into his computer console, but it returns a beeping 'ERROR' message. Frustrated by this, he activates the intercom and calls for Mr. Lowry for assistance, but there is no response. He presses another button on his console and the TV western pops into view with a blaring soundtrack. Exasperated, he races for the door - twice - to catch his idle workers, but they all seem to be going about their routine tasks each time. He shouts out above the din: "Has anybody seen Lowry?"